When Kronborg Castle was built in 1585, King Frederik II began a comprehensive canal and dam project around Hellebæk. Christian IV quickly grasped its potential. 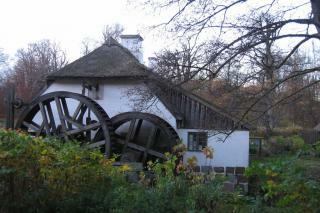 In 1598, he built a watermill, a hammer mill", and three years later the King opened a cannon foundry. In 1743, Regimental Quartermaster Stephan Hansen bought the mill. Production flourished under his management. In 1765, the state bought the mill and the present "hammer mill" was built. In 1768, the business passed into the hands of the Schimmelmann family. In 1770s, they shipped in a team of foreign gunsmiths and built them a row of houses flanking Gunsmith Street (Bøssemagergade). The town of Hellebæk grew from this core of factory and housing. " Caspar Fincke lived in Elsinore and was employed at the hammer mill and Kronborg Castle in 1622-30. In 1631, he was appointed master smith for the royal castles. Although he was respected for his exquisite craftsmanship, he was a bit of a dandy. Fincke's masterpiece is the gate to Christian IV's burial vault in Roskilde Cathedral, in which he has rather respectlessly included a rhyming verse about his own fine qualities. He also made the gate around the platform at the top of the Round Tower in Copenhagen and the latticework for the choir stalls in the Church of Our Lady in Aarhus. Christian IV often mentions him in letters and funded Fincke's considerable salary through customs duties collected on the Sound between Denmark and Sweden.